Getting casual style right is something I used to struggle with. Frocking up for the office was easy. Trying to find casual yet stylish looks to wear to Sunday brunch was a very different story. It took a long time to be comfortable putting ‘stylish’ and ‘flat shoe’ in the same sentence. To design my casual staple wardrobe I started with an Instagram search. Simple enough! I paid attention to the looks stylists were putting together and then considered how I could edit the look to suit my own unique style and body shape. The white shirt. My favourite is a soft Current Elliott collared shirt that I procured preloved from Selling Your Style. I love this shirt because the fabric is soft and I can tie it at the front. I emphasize soft ! You do not want your shirt to be stiff. This shirt looks great paired with jeans or cut off denim shorts. The skinny jean. I love Frame Denim Le Skinny jeans. My skinnies are distressed, light blue, stretchy and high waisted. These jeans are super comfortable and very versatile; they look great paired with sneakers or a chic pair of heels. The statement belt. I personally do not wear a lot belts… I’m not sure why? That being said, I love how a great belt can lift a casual look. The Gucci Marmont belt is very on trend this season, but I prefer the vintage Gucci GG belts. These vintage gems are readily available to purchase pre loved and cost a third of the price. The tailored blazer. Yes, I am a bit biased here. I am mad for a blazer! A beautifully tailored blazer is incredibly versatile and makes any casual outfit looks smart. A blazer can be paired with a blouse or T-shirt underneath and worn over jeans, cigarette pants or even denim shorts. My favourite casual blazer is by Isabel Marant in grey tweed. I also procured this piece pre-loved from Selling Your Style. The street sneaker. Sneakers not runners; Leave the Asics at home ladies! Invest in a great pair of street shoes. My favourite are a pair of black Louis Vuitton Punchy high top sneakers featuring gold hardware and a zippered back. This wardrobe essential sneaker is easy to wear and super comfortable for every day looks. The cross body bag. The options are endless. For a smart luxury cross body I love my Louis Vuitton Luna bag in cocquelicot epi leather. This gorgeous bag is an absolute show stopper. 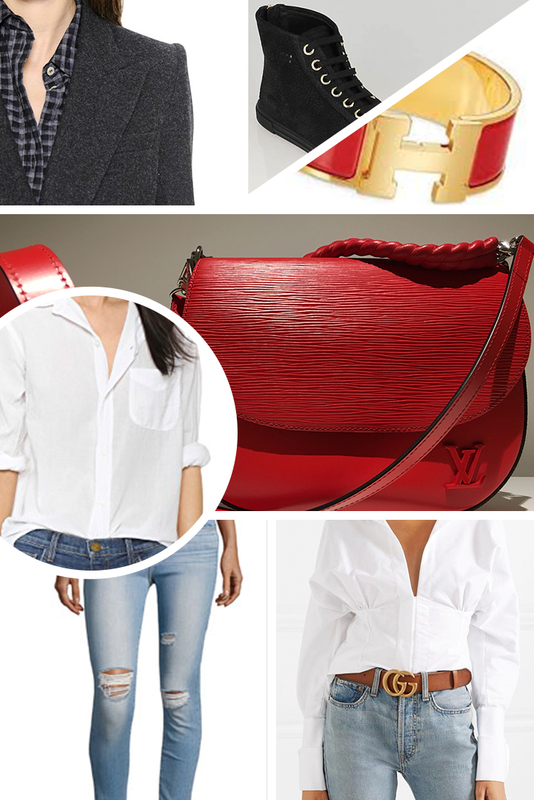 For a paired back casual look or for when I travel I carry a Louis Vuitton monogram Saumur 30. Both bags are classic, effortless to carry and comfortably fit my wallet, keys, sunglasses and phone essentials. The statement sunglasses. If you are after sunglasses with sass, you can’t go wrong with Dolce & Gabbana. I have a great pair of white square Dolce & Gabbana frames with floral print. They are playful and perfect for the warmer months. I procured these pre-loved from Gymdo Collections on the Gold Coast. The perfect accessories. Don’t overdo it; Elizabeth Taylor is not coming to brunch! For a casual look, I love Perth-based jeweler designer Carly Paiker. Her pieces are simple, classic and are effortless to wear. If you want to pack a bit more of a punch you cannot go wrong with a Hermes clic clac bangle. These statement bangles are readily available to buy preloved and are the pinnacle of casual chic accessories. While these are my core casual staples, I do have seasonal wardrobe alternatives to cater to the changing weather of the year. Us Australian ladies will brave any weather for a casual outing! Add a shawl or scarf. I love the Louis Vuitton classic monogram shawls. My favourite is a bright yellow monogrammed shawl that and I procured pre-loved from Authentic Vintage Designers. Swap street sneakers for a great leather ankle boot or knee high flat boot. I love Area Fortes or Sempre Di for ankle boots. These shoes are well made, classic and comfortable. Swap a blazer for a chic leather jacket. This is a great alternative if you don’t like a blazer or don’t feel confident wearing one. A great leather jacket keeps your style sharp and your body warm. I love a leather jacket paired with a T-shirt and maxi skirt. My favourite is a vintage charcoal and boucle Armani Collezioni leather jacket. Swap out skinny jeans for denim cut off shorts or a maxi skirt. I live in my Paige denim shorts in the warmer months. These often pop up for sale preloved and the denim wears really well. My favourite maxi skirt is a black jersey style by Helmut Lang that I procured from Selling Your Style. It is very comfortable to wear and does not crease, so always looks sharp. Swap out street sneakers for a statement leather sandal. I purchased a great pair of gold Alexander McQueen gladiator sandals from Edit and Refresh. I have been living in these sandals as they are incredibly chic and so comfortable to wear. Swap the long sleeve shirt for a silk sleeveless tank. These are readily available pre loved and versatile for every casual look. Scanlan Theodore and Alexander Wang do great silk tanks which are slightly loose fitting and breathable. These are just some of my hints for building a great casual staple wardrobe. Ultimately what we are comfortable wearing in a casual setting will be different for each of us. The key is to coordinate items in your wardrobe that are beautiful yet effortless and comfortable. Find a style that works for your body shape and buy up these basic staples whenever you can. How to store a luxury bag?